This past Monday my family and I went to see The Adventures of Tintin by Spielberg and Jackson. I don't frequently post media reviews on this blog, but I feel like writing one about this movie for a number of reasons. After reading a number of scathingly negative reviews about the film adaptation of the comic book hero that I had loved as a child when I first read them in installments in the long-since defunct children's magazine, EXPLORE, I was uneasy about the film. That, combined with the fact that Spielberg has been the mastermind behind a lot of monstrosities in recent years that it seems I was always dragged to by guy friends and then regretted it afterword––think Transformers––I wasn't at all sure that I even wanted to see The Adventures of Tintin. Thus, when my family decided to take me to see it with them, I didn't say no, but was not too excited about it all the same. My main fear was that they would end up changing Tintin's character into something awful. American movies tend to follow a very strict formula in which the protagonist starts out thinking or doing one thing, and then at some point makes a decision to change. This formula ensures that the protagonist is what English professors would call a "dynamic" character, that is, a character who changes. This tends to work well. The problem is, when Hollywood tries to adapt a story with a "flat" character who doesn't go through flux, they don't usually know what to do with it. Rather than venturing from the dynamic character mold, they often change the character. This is what ruined the Chronicles of Narnia for me, when they changed Peter, who C.S. Lewis created as a relatively flat character to make him seem more "human." Tintin, as Hergé created him, is an extremely flat character; always the impeccably good guy, which is something that set the Tintin series apart from most of the rest of the morally convoluted world of comics. So there was a myriad of ways in which I could imagine Spielberg changing him. I ended up being pleasantly surprised. 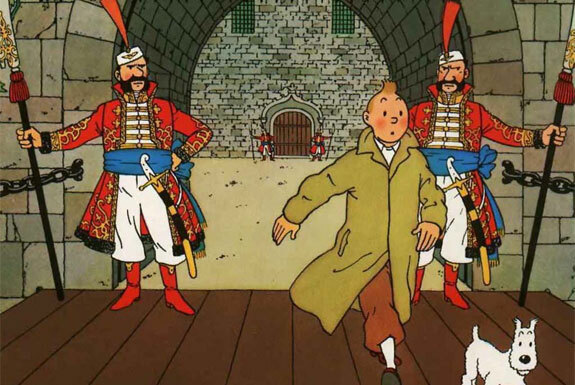 The Tintin in the movie was at least close to what I had imagined from the books, and importantly, stayed remarkably consistent. That's not to say that other characters weren't altered to fit the Hollywood formula––just that Tintin for the most part was not one of them. I'm not enough of an expert on the stories, or literature in general to say for sure what happened, but my feeling was that they ended up altering Captain Haddock's character instead, making him a more "dynamic" character who drinks because he has low self-esteem––not just because he's a swaggering sea captain, and ultimately has to make moral choices to be a better person. While this may or may not be true of what Captain Haddock was supposed to be, I feel like it's a small tragedy compared to Tintin being drastically changed to fit the mold of a normal movie plot. As far as the technical side of the movie goes, it was beautifully done (and being produced by Jackson, I wouldn't have expected any less). It's the first fully CGI movie with realistic human characters that I've seen in which I wasn't left with the unsettling feeling that something about them "wasn't quite right." In fact, I often forgot that it was even an animation. The comedic use of simple things like people running into each other felt just the same as Hergé used it, most obviously with the bumbling detectives Thompson and Thompson, but more subtly throughout the rest of the film as well. The locations in the film are also beautifully rendered, and the quick change from one to another was a page right out of the books. As to the gratuitous action sequences that some critics have claimed are alien to the books and Umika Pidaparthy called "Indiana Jones-esque," I don't really have anything to say. I've become resigned to the fact that they are just a sign of the times, as it were. All movies seem to have them, and I think they will just be something people in 20 or 30 years look back on and say "that's so early 2000s" just like excessive use of fade-through transitions in the mid 20th century or slow motion fight scenes in the late 90s tend to date movies from that time. They may not be in the books exactly, but if a few explosions or a drawn out motorcycle chase are the worst thing to complain about, then I think we have escaped rather well (and contrary to what I've read some critics insinuate, the books do actually have motorcycle chases, like the one in King Ottokar's Sceptre, even if it didn't last nearly as long or end nearly as well). While the movie has its flaws, I felt like it captured at least some of the spirit of the books, and managed to be intriguing without turning Tintin himself into some kind of psychologically confused star. And Tintin being Tintin is I think what made the books what they are. While his guesses weren't always right, his motives were. While he appeared to be worldly-wise, he was at the same time innocent, which made his ventures out into the crazy, convoluted, and at times evil world the real adventures that they are.